Under the hood, Windows 7 is a lot like Vista. Indeed, most of what gets us hot and not-so-bothered about is what's on top: When it comes to look and feel, the new UI is the biggest step forward since Windows 95. The taskbar is our favorite new UI element of Windows 7. It's the biggest change from Windows past, and in our view, the best. But it might result in some confusion at first because it groups applications that are open and those that aren't into one big party—the theory is that it shouldn't matter if it's already running or not if you wanna open it. That might kinda remind you of OS X's Dock, but it works a bit differently and definitely still operates on the Windows paradigm. Combined with Aero Peek, which makes every window on the desktop transparent except the one you're highlighting at the moment, you can find any window nearly instantly, no matter how many windows your desktop is buried under. In applications coded to take advantage of the jump list, when you right-click an icon, you'll get a pop-up menu where you can quickly select common functions. In Internet Explorer, it shows your recent browsing history; in Windows Media Player, it'll let you play recent videos; and Windows Explorer will give you quick access to pinned and frequently used folders and files. Expect jump lists to be more useful as new apps are released for Windows 7 that build functions into the jumplist. Aero Peek, which we talked about above, is a big part of what makes the new taskbar so useful. When you highlight the thumbnail preview of an app window that you might wanna open, it makes every other open window transparent, so you get a clear view of the window you're looking at. Or, if you highlight a small button on the bottom right corner of the taskbar, every window will become see-through, for a quick peek at your desktop or gadgets, Windows 7's free-floating widgets (more on those below). Gone is the Quick Launch bar, where you used to store shortcut buttons to your favorite apps. Now they just hang out on the taskbar with open applications. When you "pin" something, like an app or folder, it's got a permanent spot on the taskbar for easy access. When the app is running or the folder is open, the icon has a glossy sheen over it. One quirk with folders: If you try to pin more than one to the taskbar, they're all collapsed into a single "Windows Explorer" icon. Also, if you pin a file to the taskbar, it's actually pinned to the icon of the program that opens it, so you'll have to right-click that icon to pop up the jump list (see below) and select it from there. Here's where we really get into what makes Windows 7's UI really special and so different from past Windows versions—the way you handle and manage windows, and by extension, applications. It'll change your life! Maybe! Okay, not really. But it will give you a warm feeling in your tummy. Or that could be the Mexican food you ate last night. Shake, rattle and roll, sucka. Aero Shake is the new UI thinger that's useless-but-neat. Grab whatever window you want to be the only one you see, and shake it. Everything else will be minimized. But then you have to have re-open all of 'em, so not that useful overall. Correction: Shaking again will revive all of the windows. Aero Peek, which we talk about above, is better. Maybe it's just a side effect of splitting my time on a Mac, but I don't really maximize windows that much anymore, and I think the new Windows UI makes you less likely to do it, too, since it's easier to deal with having tons of windows open and scattered around your screen. But if you do wanna make a window of an open app or document swallow your entire monitor, just grab it and drag it to the top of the screen. You'll get a slick little animation indicating that when you let go of the mouse button, the window will blow up to cover your whole screen. To unmaximize, just grab the top of window and pull down—it'll instantly go back to its original size. Snazzy, no? Another Aero snap feature: Drag a window to the far left or right of your screen, and when your cursor touches the edge, it'll make that window take up exactly half of your screen. Nice, especially on widescreen monitors. Really, Windows 7's isn't too different from the Windows you've known and loved (or loathed) for years. It just has a handful of new UI features scattered throughout that make it easier than ever to multitask with Windows, with the side effect of making it look modern and kinda neat, too. Here's a rundown of the new ooie GUI hotness and what it does. Microsoft has made themes—the unified look across your PC, like the color of windows and your wallpaper—more prominent than ever in Windows 7, and much easier to save, download and swap out too, depending on your mood. Just right-click on your desktop and press personalize, then you can change them, or Microsoft will direct you to where you can download more. 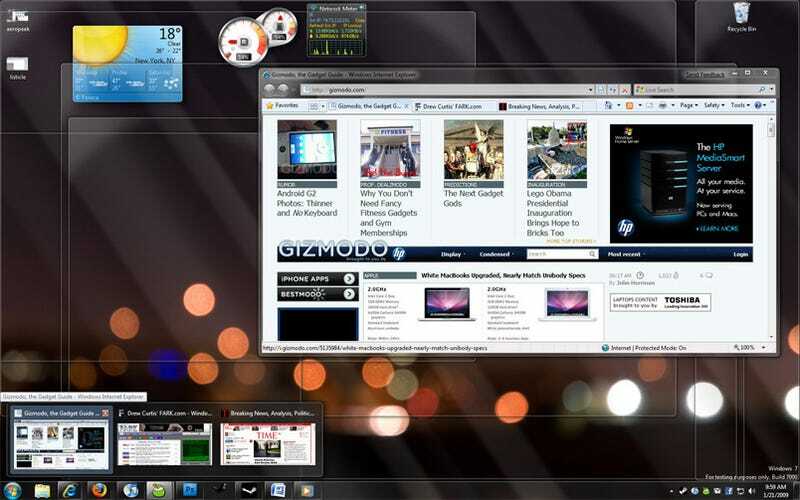 Or, if you wanna be more pro, check out Lifehacker's guide to Windows 7 themage. There's a slew of new keyboard hotkey shortcuts that use the Windows key, making it feel useful for the first time ever. (And I've been using Windows for like, ever.) Two you should memorize right now: Win+T cycles through apps on your taskbar for quick access to programs, and Win+G brings all of your gadgets to the front. Check the whole list here.